A rendering of the proposed Nemadji Trail Energy Center in Superior, Wisconsin. Wisconsin regulators will only consider the proposed plant’s site, not whether it is necessary. Clean energy advocates will get a second chance to block a proposed natural gas plant in northern Wisconsin, though odds will not be in their favor. The 550-megawatt, $700 million Nemadji Trail Energy Center is expected to go before Wisconsin regulators next year after winning approval from Minnesota’s utility commission in October. The gas combustion turbine plant would be co-owned by Wisconsin’s Dairyland Power Cooperative and a subsidiary of Allete, the parent company of Minnesota Power. Unlike in Minnesota, where a bitter debate was fought over whether the plant is needed, in Wisconsin regulators will only consider whether the proposed site is appropriate. Along with a narrower scope, opponents will also face a commission appointed entirely by Wisconsin’s outgoing Republican Gov. Scott Walker that is generally unmoved by environmental arguments. Various Wisconsin clean energy and environmental organizations are likely to oppose or question the plant, but none has taken a formal stance yet because Dairyland Power has not filed the paperwork to begin the Public Service Commission (PSC) process, which is expected next year. Wisconsin Public Service Commission staff anticipate the public outcry that happened in Minnesota will be repeated in Wisconsin. The idea to build a new natural gas plant first surfaced more than two years ago. Dairyland and Minnesota Power have said the plant would help them add more renewable power and meet anticipated load growth. That’s the case Minnesota Power made to regulators on its side of the border. Minnesota regulators sided with the utility 3-2 despite arguments from clean energy advocates and a group of industrial customers that contended the region’s power needs could be better met through renewables, efficiency, or a smaller power plant. Due to statutory limitations in Wisconsin, regulators there will only decide on the plant’s siting. Since Nemadji Trail would be a “wholesale merchant plant” or “independent power producer,” not formally owned by a utility, the state has only limited jurisdiction, said Jim Lepinski, chief engineer of the PSC’s Division of Energy Regulation. But because of the size of the plant, Dairyland will have to file a more detailed Certificate of Public Convenience and Necessity (CPCN). The state has seen a resurgence in independent power producer applications at the commission. Ratepayers can be protected later in the process when the commission reviews agreements between producers and utilities that include the price of electricity consumers and businesses will pay, Lepinski said. The plant has a complex ownership arrangement, with Dairyland Power partnering with Allete-owned South Shore Energy LLC. The application will include ownership details, as well as affiliates of the plant, among them Allete-owned Superior Water, Light & Power, which would supply power and potentially water to the plant. Another is American Transmission Co., which owns lines that would connect the plant to the regional power grid. “There’s a ton of intricacies involved here,” Lepinski said. Dairyland’s preferred site in Superior, Wisconsin, already has natural gas facilities and transmission lines. The commission may need to authorize relocating gas facilities at the location, which has a history before the commission as the site of a proposed power plant in 2005 that was never built. Once the application is submitted and completed, the commission will have 180 days to take action or request a 180 day extension. Since the project will require an environmental impact statement, has a complicated financial structure and a location more than 300 miles from Madison, the process could take nine months to a year “at best,” Lepinski said. During the process, the public will have several opportunities to comment. 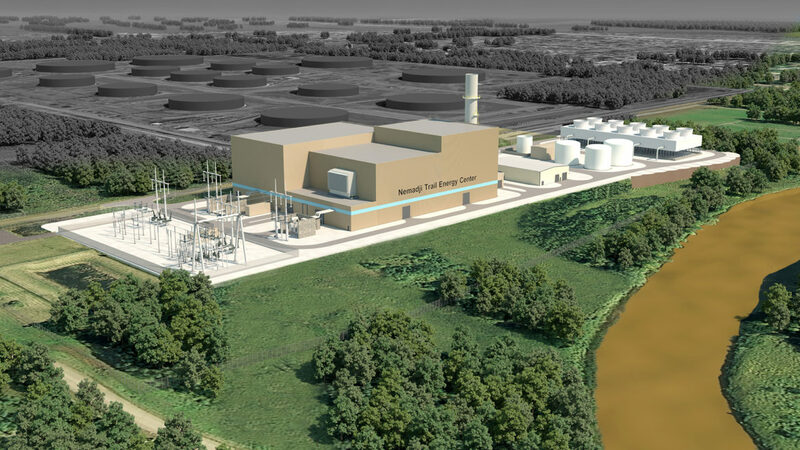 Wisconsin regulators have approved one other natural gas plant in the past decade, the $700 million Alliant Energy project, which was an addition to an existing plant near Beloit in southern Wisconsin. Minnesota Power argued the new plant would help it to expand wind and solar resources by serving as a backup when renewable energy generation dips. LaCrosse-based Dairyland Power Cooperative, which serves 24-member electric cooperatives in Wisconsin and Minnesota, makes the same argument. “We’re trying to diversify our portfolio into things other than coal, and that is wind, solar, hydro and certainly gas,” said Rob Palmberg, vice president of strategic planning. The gas plant would allow it to “fill the valleys when we don’t have the wind blowing and sun shining,” he said. Palmberg conceded Dairyland is still heavily dependent on coal, with only 16 to 17 percent of its generation coming from renewables. The utility is on track to reach 20 percent renewables soon, he said, with a “soft goal” of reaching 25 percent renewables. The company’s website shows coal, however, will still account for half of energy production in 2027. For Dairyland, a new natural gas plant also would offer the kind of flexibility it once had in an aging facility in Alma that closed in 2011, he said, which had a capacity for ramping on and off rapidly, a trait no other facility in its generation fleet offers. Another reason for the plant stems from increased power demand. One Illinois and three Minnesota members of Dairyland are adding territory once powered by Alliant Energy. “They add significant load to our system,” Palmberg said. Now Dairyland will be fully or partly providing energy to the new acquisitions, which be completed by 2025, about the time Nemadji Trail Energy Center is expected to begin operation. The Superior location fits nicely for serving Dairyland and Minnesota Power and because it sits near a gas source and a 345-volt transmission line, he said. Though environmental concerns have been raised about the plant’s proximity to the Nemadji River, it does not touch the water and it should have no impact on nearby wells. The idea that natural gas plants will assist in transitioning to cleaner power by serving as a backstop for renewable energy is debated. A recent report sponsored by the Minnesota Department of Commerce suggests wind and solar could power 70 percent of the electric grid with a continuing but small role for natural gas plants while proposing a large increase in battery storage. Katie Nekola, general counsel for Clean Wisconsin, said her organization will “fight this thing,” and likely draw on some of the same arguments made against the plant in Minnesota. Should regulators approve the natural gas plant construction could begin in 2020, according to Dairyland officials. A Wisconsin utility will permanently retire three coal-fired units under a legal settlement the EPA announced Friday.